To begin, I used the Birch Tree Cutting Plate to cut some Buttercream Frosting cs. I layered that over some Toffee cs and then filled in the negative space by cutting a piece of Toffee cs with the Birch Tree Cutting Plate. My lesson is not to give yourself two thick layers of cs to cut through when trying to do the inlaid die technique LOL! 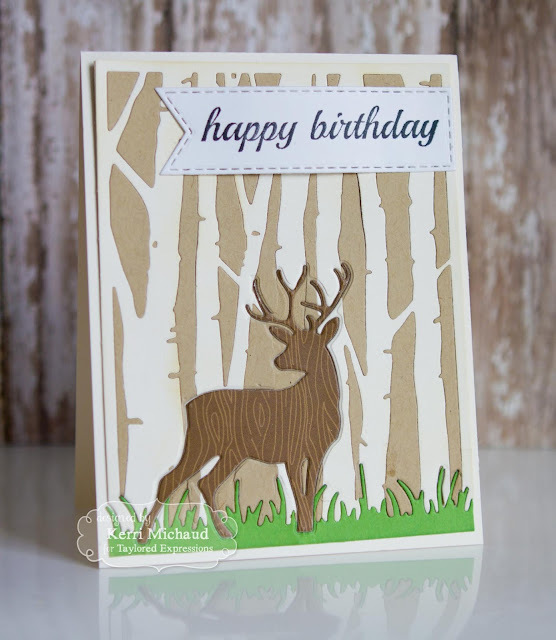 After I got my background put together, I cut my deer using a Birch Tree Accessories Die out of some Build a Scene dp. I also cut the grass using the Wispy Grass Border Die and some Peapod cs. I then cut my background using these dies and used the inlaid technique to fill in the space with my die cuts. Finally, I added the sentiment that I stamped using the In & Out Birthday Stamp Set and I cut it out with a Stitched Banner Stacklets Die. Perfect for a masculine birthday! Thanks for stopping by today, and have a wonderful Wednesday! Love this technique! This turned out great!